I remember the "news flash" when North Carolina, California and then Oregon offered apologies for the sterilization programs which they ran in their states from the early 1920's through World War II. 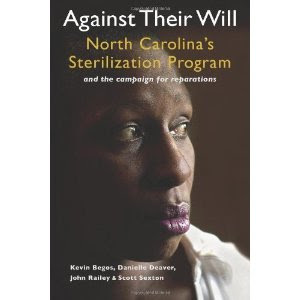 North Carolina, however, ran their program as late as the 1970's and in 2002, the Winston-Salem Journal began investigating the state's Eugenics Board and sterilization program. They ran a series of articles on their findings in the Journal which have been collected and reprinted into this book, Against Their Will . "The study of or belief in the possibility of improving the qualities of the human species or a human population, especially by such means as discouraging reproduction by persons having genetic defects or presumed to have inheritable undesirable traits (negative eugenics) or encouraging reproduction by persons presumed to have inheritable desirable traits (positive eugenics)." Francis Galton was the cousin of Charles Darwin and was influenced and inspired by Darwin's work, particularly Darwin's notes on the breeding of domestic animals. Galton began his research and released a book entitled Inquiries into Human Faculty and its Development in which he coined the phrase "eugenics" (although he had been writing about it much earlier than the publication of this work). From what I understand, Galton promoted the idea of positive eugenics - suggesting that the elite and prominent figures in society marry early and be given monetary incentives to reproduce. His ideas formed the base-work for the eugenics movement which was built upon and embraced as a very good idea. In these articles, authored by Kevin Begos, Danielle Deaver, John Railey and Scott Sexton, the Journal had access to documents which are still, in some cases, being held under lock and key. These four individuals traveled the country conducting interviews with people who had been sterilized during the period between 1929 and 1974 when the Eugenics Board was dissolved. The stories which they tell in Against Their Will are amazing, heart wrenching and absolutely infuriating. Sadly, the Eugenics Board would make their lofty decisions over whether or not to have an individual sterilized based on a paltry paragraph of information which had been condensed from social workers' reports. People - mostly women and African American, although that was not always the case - could be sterilized for any variety of reasons included: lack of income, an illegitimate birth, or for having a low IQ. In one case a young girl was sterilized as a young teen simply because her mother had had almost a dozen children which she could not afford. Not feeling as if her daughter ought to have the right to bear children also, this same mother naively gave a social worker permission to sterilize her daughter. At the time, the young girl was told that she was going to have her appendix removed. It was not until years later, in her child bearing years, that she discovered that she had, in fact, been sterilized. It is so difficult to conceive of a government who forces sterilization upon its citizens without their consent. Un-remarkably, the idea of eugenics fell out of favor with the general public after World War II when Nazi horrors were being revealed. States all across the Union began shutting down their eugenics programs except for North Carolina who persisted in this madness. The investigation and exposure of North Carolina's decisions revealed in the Winston-Salem Journal caused the governor, Jim Hodges, to issue an apology for the state's program. California got in line behind Hodges and issued a similar apology as did the State of Oregon. Lives were ruined. Women tell of getting married after they were sterilized, only to discover that they could not have children. Some were divorced as a result of this. Many say they feel violated and less like a woman as they no longer have the ability to bear children. This decision, which was made on their behalf, without proper education or support, has left them crippled to a degree. And it is sad. Yet because we do not pay attention and know our history, it would seem we are doomed to repeat it. Just this past August 1, 2012, thanks to provisions in Obamacare, girls in Oregon of the age of 15 (and in some cases 12) are able to be sterilized without parental consent. Now you might argue that there is a difference between the state forcing a sterilization and a state offering the procedure for free. Grant it, there is difference in the manner which the procedure is being presented as an alternative to other means of birth control. However, neither forcing or offering sterilization is the right thing to do. There is certainly valid arguments to be made against the idea of allowing a 12 to 15 to 18 year old boy or girl make a life-altering decision which will effect the entire course of their future. If we think there will not be ramifications to this new law then we are gravely mistaken and we should be very afraid of the consequences. Reading the emotions of the people who were sterilized against their will will shake you up a bit as you realize that a great many people do not think through consequences to their actions. (It's hard to understand sometimes, but it's true.) A 15 or 16 year old who is making the decision is likely going to be swayed by his or her emotions of the present moment as well as by fear. It is unlikely that a girl of 15 (or younger?) has any idea of how her life will turn out; she will not know if her future spouse will want children. She may decide she wants them herself. And then what? The future is so great and so unknown that to sterilize them is a cruelty! Furthermore, to sterilize them without seeking counsel of their parental figures - those who likely love them best and can advise them property - is a complete outrage! Logically, it does not make sense to offer a child who does not have the right to drive, drink or vote to sterilize herself for life. The consequences are perhaps greater than she can comprehend at this exact moment in time. We will repeat history here, folks. The children today who decide to be sterilized will be emotionally distraught in another fifteen years or so, when they come to fully realize the consequences of their actions. The pimps who want to use young girls without threat of a pregnancy will be delighted at this opportunity. Furthermore, the threat against parenthood is outrageous. We must learn our history. We don't even have to look back that far to realize that sterilizations leave a permanent mark on the person that they can never completely heal from. It changes who they are as God designed and made them and this issue should warrant our attention. I know this isn't a fun book to read, but in light of our present day society and the choices those in authority are making on our behalf, I think it's a necessary book and topic to be aware of (and read). As I said, it wasn't pleasant a pleasant read. But it will make you think. And we need people to think very carefully right now. Thank you, PR by the Book, for shooting a copy of this title my way in exchange for my honest opinion. I hadn't realized that eugenics was practiced widely in this country until reading Unknown. The fear of being sterilized was one thing that helped Louis in that book to turn his life around, as he was a poor student and a major thief at first. And as i started reading your review, before I got to the part about Darwin, I could see his influence on this thinking. Can I "like" Barbara's comment...esp the last line? You are so very right about the implications today. Also, if you're actually concerned about teen exposure to STDs, there probably isn't anything worse you could do than offer sterilizations--which, of course, will do nothing to prevent the spread of STDs, but will probably result in much less are being taken because, hey, they can't get *pregnant*. Again, Carrie, a great post. Thanks for bringing this sordid history to light. I might add that once one starts looking at "the poor" as the other, rather than as fellow humans with equal dignity, this follows naturally. Although others made the connection previously, Swift's "A Modest Proposal" is still one of the best at following the thought to its logical conclusion. Until we begin to value those different from us, rather than looking at them as threats to our safety, or (even morally) to our children, and our lifestyles, there will continue to be a push to make sure that they are exterminated. Very timely, as I just finished watching "Rabbit Proof Fence". I'm assuming the movie was fairly historically acurate, as I haven't done any research myself. Love what "Diary...." said about the poor. The things that have been done because of looking at others as less human than "us" are just horrifying. Like you said, another result of believing in evolution. So sad. Extremely timely post. I teared up just reading your review. How awful!! What a truly scary time we are living in, even more scary that I live in Oregon! I'm actually to the point I don't want to take my kids to the doctor especially now that they are becoming young adults. Wow, that is shocking that Oregon is taking on once again under Obama's plan. Wow, I just can't even think what else to say.